Is Ethiopia the cradle of humankind? I don't know for sure, but it’s an ancient land that has a very rich cultural history and is one of the best kept secrets in the world. I was introduced to the incredible five million year history of this fascinating mountainous country in the Horn of Africa at the Ethiopian National Museum. The guide walked me through the more than 150 artifacts on the ground floor of the museum. 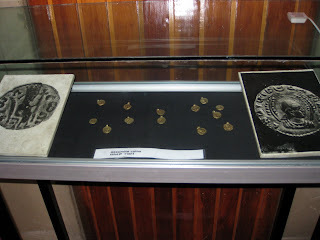 The exhibits included fossils, historical manuscripts, paintings, coins, musical instruments, tools of daily use, religious artifacts and many, many more. This exciting tour began with the story of ancient Ethiopia and the Kingdom of Axum in the northern highlands. My guide began by asking me if I knew the story of King Solomon and Queen Makeda. I told him that of course I know about King Solomon, and the Queen of Sheba, but not Queen Makeda. Well, he said, tell me what you know of Sheba. I became embarrassed and told him that in I Kings and the Chronicles of the Old Testament it describes the Queen of Sheba as a woman of great beauty, immense intelligence and a powerful ruler of ancient Ethiopia who travelled to ancient Israel to meet the wise, wealthy and powerful King Solomon. She eventually gave up her gods and converted to the God of the Israelites. "Makeda, he said, "is known outside of Ethiopia as Queen of Sheba. "Many Ethiopians believe and it is our tradition that King Menelik I is the son of King Solomon and Queen Makeda “Sheba”; Menelik I became king when his mother died about one thousand years before the birth of Christ. And King Menelik began a line of Solomonic dynasty. Our ties to ancient Israel runs deep, Christianity came early to Ethiopia very early, and the churches are ancient and unique, like nowhere else in the world". During a period of about seven centuries, Ethiopia was a land of kings; a succession of kings ruled a territory that covers present day Ethiopia, Eritrea and Yemen. During these years the country rises to become a religious, economic and cultural power. Throughout the centuries Ethiopia flourishes and ended with the modern day Ethiopia and the end of the reign of Emperor Haile Selassie I, the King of Kings. At last, I arrived downstairs at the second part of my tour which examines the species of early hominid, an ancestral member of the human family. Here I was, face to face with the world’s most famous fossil lying in a glass coffin. It contained a skull bone, some ribs, a pelvis, a lower jaw; in all about 47 bones (my guide told me this is a replica, the original is usually locked in a vault) of a skeleton, nearly 40% of a hominid that had lived approximately 3.2 million years ago. 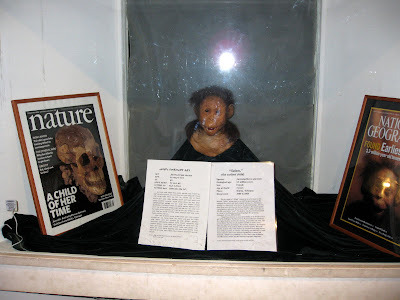 My guide explained to me that on November, 1974, two paleoanthropologists, Donald Johnson and Tom Gray discovered Lucy at Hadar in Northern Ethiopia. After extensive research and sorting, it was determined that the fossil is a female based on its small size and the shape of its pelvis. She would have stood at 3.5 feet and weighing around 65 lbs. He said that Lucy is one of the oldest and most complete human adult ancestor ever found anywhere in the world. The fossil got its name from the popular Beatle’s song “Lucy in the sky with Diamond” that was being played over and over at the celebrations of its discovery, but in Ethiopia, she is called “Dinkenesh”, which means “You are Wonderful” in Amharic, the official language of Ethiopia. The next ancient fossil I met was older than Lucy by 150,000 years. Her name is “Selam” which means “Peace” in several Ethiopian languages. (Ethiopia has over 80 living languages) She represents the earliest and most complete skeleton of a child human ever discovered in the history of paleoanthropologists. 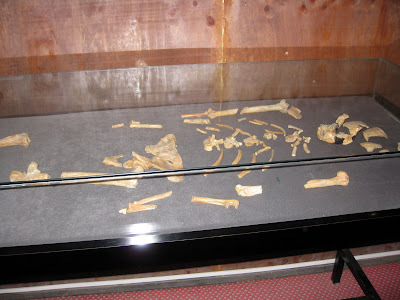 She was about 3 years old when she died and belonged to species Australopithecus afarensis. She lived and died 3.3 million years ago. This skeleton was discovered and studied by a team led by Ethiopian paleoanthropologist, Dr. Zeresenay Alemseged, between 2000 and 2004. Selem was found in an area called Dikika, in the North Eastern part of the Ethiopian Rift Valley. Selem is housed in the National Museum of Ethiopia and what I’m looking at is a model, the original skeleton is still under cleaning, preparation and study. This extraordinary find has enabled scientist to answer many important questions pertaining to the anatomy, behavior, development and locomotion of the earliest children and their species. When the detailed analysis of the whole skeleton is completed it will help address many critical questions in relation to the biology and behavior of early human ancestors. Due to her immense significance to science and humanity “Selem” was published as a cover story in the prestigious scientific journal Nature and National Geographic Magazine. 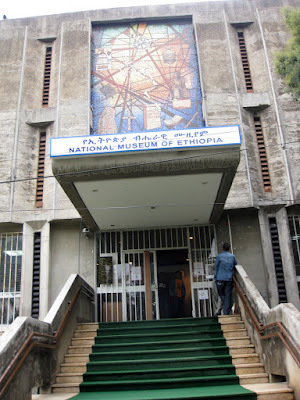 If you are ever in Addis Ababa, the National Museum is a quality museum to visit. The guides are very knowledgeable and the entrance fee is very inexpensive. In fact, this entire Horn of Africa country should be on your travel wish list, and now is the time to experience Ethiopia’s treasures without the hordes of tourists that you find elsewhere. 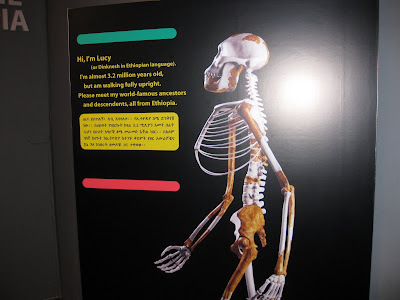 On October 1, 2009 researchers presented the oldest hominid fossil, also found in Ethiopia; a million years older than Lucy and her name is Ardi. NOVA First Steps: Six million years ago, what set our ancestors on the path from ape to human? Aired November 3, 2009 on PBS. Part 1: "First Steps," examines the factors that caused us to split from the other great apes. The program explores the fossil of "Selam," also known as "Lucy's Child." Paleoanthropologist Zeray Alemseged spent five years carefully excavating the sandstone-embedded fossil. NOVA's cameras are there to capture the unveiling of the face, spine, and shoulder blades of this 3.3 million-year-old fossil child. And NOVA takes viewers "inside the skull" to show how our ancestors' brains had begun to change from those of the apes. The other programs in the "Becoming Human" series are Part 2: "Birth of Humanity," which profiles the earliest species of humans, and Part 3: "Last Human Standing," which examines why, of various human species that once shared the planet, only our kind remains. Linda, very interesting article! I especially liked the article about the child fossil of so long ago. I also enjoyed the story about the churches that were carved out. Would love to visit this beautiful country and wishing I could help.